Boat are a fantastic recreational vehicle. They give hours of pleasure, tons of memories, and countless laughs to boat owners, their families, and friends. Whether you're cruising on lakes, rivers, inlets, or the ocean, owning a boat gives you the freedom to enjoy the water on your schedule. However, with the fun of boat ownership also comes plenty of responsibility and decisions. Often the first thing that individuals thinking about purchasing a boat must decide is where to store the boat when they're not using it. The answer often depends on various factors such as where you live, the size of the boat, how often you plan to use it, and your budget. If you have a vehicle that can tow the boat and live in a neighborhood that allows it, you may consider parking your boat at home. This provides you with easy access for loading up the boat for a day or the weekend or performing regular maintenance and repairs. If at home storage is not an option or if you want your boat to be parked closer to the water, you may consider a marina or storage facility. A wet storage marina offers an advantage of being ready at a moment's notice. This is great for individuals who like to have the ability to hop on the boat any time they want. However, there are disadvantages to keeping your boat in the water and in direct sunlight at all times that should also be considered. Dry storage facilities, such as Vines Storage in Redlands, offer boat owners the ability to safely and securely store their boat when they're not using it. Whether you're storing it for several days, weeks, or months, you'll know that your boat is safe in a climate-controlled environment. 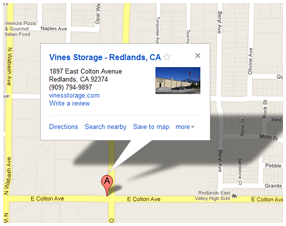 Vines Storage also offers extra benefits such as a gated entrance, security cameras, and amenities. And because the storage facilities are large enough that you can load up and drive away with your boat, you can enjoy more time on the water, whenever you get the urge to go. For more information about storing your boat at Vines Storage, call our office today.